As a salesperson (or someone concerned about sales at your company), you probably have a say in which tools will help you grow sales. Here at KeyReply, we spend a lot of time researching what our landscape looks like so we can provide the most value to our customers that is not only suited to their needs but also unique and differentiated. 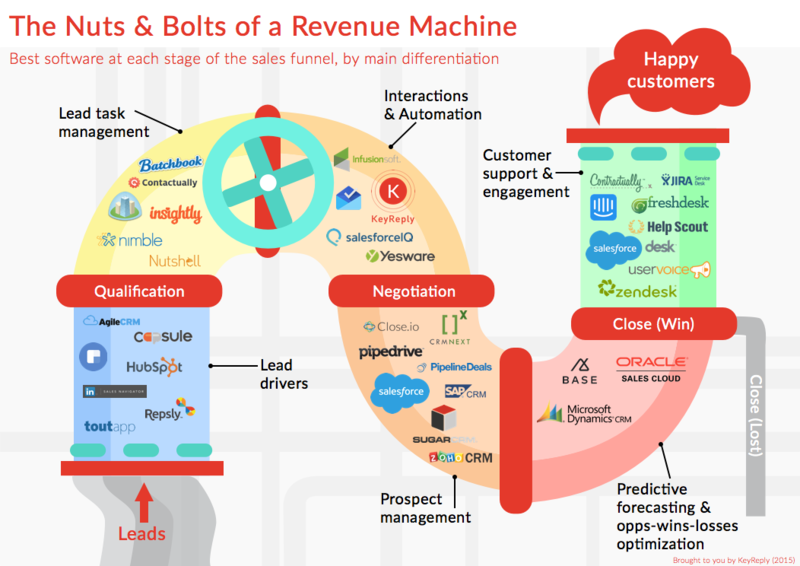 So after all the research we’ve done so far, we decided to put together an infographic that shows the best sales tools money can buy today, and where their strengths lie along the sales pipeline. These tools are truly the nuts and bolts that make up the entire pipeline, running from lead generation to lead tracking, interactions with leads, prospect management, prospect closing, and after-sales service and support. We offer our opinions on where these tools excel in the sales process, and don’t actually mean that they are only in that space. As you can imagine, most of the CRM tools have overlapping or all-encompassing offerings that go from lead generation to the actual close. Also, we’ve included customer support tools as a way of showing that sales don’t just end with a close - it ends with nurturing and taking care of customers in an ongoing manner. In the lead generation space, we’ve included the most effective lead generation tools that run the gamut from inbound to social to sales enablement. These drive leads into your funnel so your SDRs (sales development reps) can qualify them quickly. [AgileCRM] (https://www.agilecrm.com/) – Great for lead generation when they started, but have now branched out into becoming a complete CRM system. [CapsuleCRM] (https://capsulecrm.com/) – Big focus on lead tracking and communications, especially on syncing your emails to your CRM. [ClearBit] (https://clearbit.com/) – Helps you find good leads and look up contact information on the leads you’re trying to reach. [Hubspot] (http://www.hubspot.com/) – A real thought leader in the inbound space, Hubspot helps you drive leads through inbound marketing. [LinkedIn Sales Navigator] (https://business.linkedin.com/sales-solutions) – Leverages on the LinkedIn network for social selling. [Repsly] (https://www.repsly.com/) – Mobile CRM for field teams that require CRM and data collection systems on the go. [Tout App] (http://www1.toutapp.com/) – Considered in the space of “sales enablement”, it’s a good way to run marketing right next to sales. After leads start going through the process of qualifications, there are some tasks and actions that need to be done to get them better acquainted with your offerings. For many SMEs, the most effective CRM tools are clustered in this space since they are more likely to have slight shorter pipelines than large sales teams - hence the task management aspect becomes crucial in helping teams to manage their leads. [Batchbook] (http://batchbook.com/) – Marketed specifically as a small-business CRM, it helps teams manage to-dos related to clients. [Contactually] (https://www.contactually.com/) – Helps you to follow up with your leads more consistently so they remain warm to you. [Highrise] (https://highrisehq.com/) – From the team behind BaseCamp, Highrise targets smaller businesses with this CRM. [Insightly] (https://www.insightly.com/) – Very popular CRM for small businesses, and promises to make you a small superhero. [Nimble] (http://www.nimble.com/) – Updates your contacts automatically with social information, and helps you figure out who to talk to. [Nutshell] (https://www.nutshell.com/) – Prides itself on its integration with other tools, and organizational abilities. The interactions with customers need to be tracked, and most people use apps to track how their leads are doing and what they need to follow up on. At this point, after leads have been qualified, more needs to be done in terms of preparations for negotiations and understanding of final decision makers and specific needs. Intelligence and automation in this space is important for a process-oriented pipeline to optimize for negotiations to happen. [Infusionsoft] (http://www.infusionsoft.com/) – Automated marketing and referrals are the main pitches for Infusionsoft (though they do it all). [Inbox by Gmail] (https://inbox.google.com/) – With the introduction of Smart Reply, it can help you get started replying emails faster. [KeyReply] (https://keyreply.com/) – Reply faster to common queries with a keyboard that has your team’s responses within any text field on mobile. [SalesforceIQ] (http://www.salesforce.com/salesforceiq/overview/) – Captures your email interactions, and provides intelligence on follow up. [Yesware] (http://www.yesware.com/) – Track who’s seen your emails and send personalized-looking mail with Mail Merge. Once leads become qualified, they are prospects that we need to drive to a close. This often means that the biggest and baddest (in this context that’s a good thing heh) CRMs are jostling to help teams log their movements through negotiations. You can see that most of the best CRM tools sell their products as prospect management software, even though they do start logging interactions way before this, even as leads. Primarily though, and for illustration purposes, CRM tools fall in the category of prospect management. [Close.io] (http://close.io/) – Main feature is the fact that you can make calls within 1 click on the pipeline management dashboard. [CRMnext] (http://www.crmnext.com/) – Flexible deployment on either private or public cloud, good for verticals with specific security needs. [Pipedrive] (https://www.pipedrive.com/) – Lightweight and easy for small teams to start managing pipelines. [PipelineDeals] (https://www.pipelinedeals.com/) – Sales productivity is the name of the game in their marketing, and it’s simple to get started. [Salesforce] (http://www.salesforce.com/) – The #1 CRM in the world. What did you think? They created the category as we know it today. [SAP CRM] (http://go.sap.com/solution/customer-engagement.html) – Integrates data from various customer functions across channels. [SugarCRM] (https://www.sugarcrm.com/) – Affordable enterprise CRM that is one of the most highly customizable in integrations and deployment. [Zoho CRM] (https://www.zoho.com/crm/) – Extension of the Zoho suite of products, and free/affordable to start for small teams. Some CRM tools pride themselves on their ability to draw out pertinent data and predict the win rates for prospect accounts (based on the probability that they will close). As we’ve seen above, with access and understanding of the entire process, it can be useful to have a predictive forecast of the likelihood of certain accounts closing, so sales teams can focus on those most likely to be worth their time. Not every lead can be a win, so some measure of understanding about the opportunities, wins and losses will help the sales organization become even better at optimizing and improving their sales processes over time. [Base] (https://getbase.com/) – Touts its ability to find insights and optimize the right accounts to focus on to get higher win rates. [Microsoft Dynamics CRM] (https://www.microsoft.com/en-us/dynamics/crm.aspx) – Predictions across channels using analytics drawn from different sources along the customer journey. [Oracle] (https://www.oracle.com/applications/customer-experience/sales/index.html) – Helps you identify “white spaces” for upselling and cross-selling to customers, on top of predictions. After the close, account management and customer support becomes an imperative to keep customers. You’ve heard the saying - it’s easier to retain a customer than to acquire one, so it’s a company’s job to take great care of their customers with world-class support systems, behavioural/drip marketing (you can find debates on which is better, but we vote behavioural), open lines of communication, and self-service tools. [Contractually] (http://www.contractual.ly/) – Easily let closed customers seal the deal, by managing and signing contracts online. [Freshdesk] (https://freshdesk.com/) – Popular customer service helpdesk software, free/affordable to start for small teams. [Help Scout] (http://www.helpscout.net/) – Knowledgebase site and embed forms on every site, on top of ticket management. [Intercom] (https://www.intercom.io/) – Makes it really easy to manage and reach customers in the same place, with little development time. [Jira Service Desk] (https://www.atlassian.com/software/jira/service-desk/) – Manage IT tickets and support tickets together for faster issue resolutions. [Salesforce Desk] (http://www.salesforce.com/desk/overview/) – A relatively newer offering from Salesforce, good for scaling teams. [Uservoice] (https://www.uservoice.com/) – Lets users vote on features to help the product management process, plus a knowledgebase for support. [Zendesk] (https://www.zendesk.com/) – Integrates all inbound service requests, with self-service knowledgebases and a “multichannel” strategy. Where does KeyReply fit in all this? KeyReply is a mobile keyboard solution that allows teams to reply better & faster. As we’ve developed over time, we’ve added a Mac App too so that teams can use their best replies on desktop too. This means that all consistent and high quality, high converting replies to leads and prospects can be managed by sales team managers or added by sales executives as they interact with customers. With replies at the touch of their fingertips, it literally saves reps 10x as much time spent on replying to redirect towards actually closing, shows their responsiveness to clients, and helps them use great replies they know will increase their likelihood of closing. There are some general factors that you should consider when picking your own set of tools, including the size of your team, how fast you’re scaling, sales amounts, support needs, and important features that appeal to you including deployment and mobility. This warrants another post in itself, but you can definitely use the above as a guide to start your selection process. Generally, a combination of lead drivers in section 1 + a good reply platform in section 3 + a lightweight (or free) option in section 4 or 2 will be a good bet for smaller teams to get started. Once the team and customer numbers grow, and support requests start flooding in, a tool in section 6 will be important for both service and product managers to understand how to better improve customers’ experience.